In Flat Earth's Comedy "The Memorandum"
From January 11- 19, Flat Earth Theatre celebrates the legacy of legendary Czech playwright, president, and revolutionary leader Václav Havel with a production of his absurd comedy, "The Memorandum." Presented in an English translation by Vera Blackwell, the production will play in the Black Box Theater of the Arsenal Center for the Arts, 321 Arsenal Street in Watertown. The Flat Earth production accentuates the humor and camaraderie in the adventures of Josef Gross, whose unexpected wanderings through the ranks of his department inadvertently parallel Havel’s own improbable journey from protest playwright to political prisoner to president. When he receives an interoffice memo in the new "scientific language," Ptydepe, Gross discovers that affairs in his department are not entirely under his control. Without proper documentation, the befuddled Managing Director finds himself running in circles in search of a translation. To complicate matters, the Deputy Director attempts to usurp Gross’s job, everyone in the Ptydepe Translation Center has gone to lunch, and the Staff Watcher is keeping a close eye on the supply of cigars. The company features Jim Remmes, Chris Chiampa, Patrick Curran, Kevin E. Parise, Lindsay Eagle, Dori Levit, Marty Seeger, Kevin Kordis, Chris Anton, Matt Arnold and Emily Hecht. 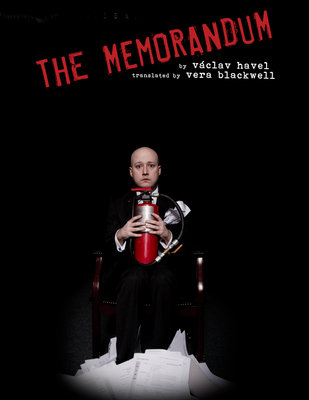 First performed in Prague under the shadow of Soviet-backed totalitarianism, "The Memorandum" lampoons the bureaucratic appropriation of language with a satirical spin still representative of today’s global office culture. Director Victoria Rose Townsend’s treatment examines the thin line between a recognizable reality and the world of bureaucratic chaos evocative of Terry Gilliam's "Brazil" and Mike Judge’s "Office Space." The language of Ptydepe, intended to optimize efficiency and accuracy in communication, is brought to life with the help of company linguist Devon Jones, who has worked with the cast and director to create order and meaning from the untranslated gobbledygook of Havel’s absurd linguistic creation. For tickets, call 1-800-838-3006 or visit http://flatearththeatre.com. Students with valid ID can purchase $10 student rush tickets at the theater starting one hour before the show, and there will be a Pay-What-You-Can performance on Thursday, January 17, at 8PM.